What's the used Volkswagen Golf estate like? The seventh generation of the Volkswagen Golf Estate marries the excellent driving manners, fine build quality and frugal engines of the hatchback with more than enough space to keep most families happy. Compared with the already roomy Golf hatchback, this estate offers approximately 35% more boot space. What’s more, the low loading lip, easy-to-fold rear seats and adjustable boot floor mean it ticks as many boxes as it can hold. You get a decent amount of space for passengers too, with four adults able to travel in comfort in what remains one of the classiest interiors of any mainstream car. In short, it’s a very practical machine. In fact, the biggest problem you are likely to encounter when looking for a Golf Estate is finding one. That’s because Golf hatchbacks on the used market outnumber estates by about ten to one. Things are trickier still if you want an estate powered by petrol rather than diesel; again, the latter outnumber the former by approximately ten to one. Both manual and automatic gearboxes are available, and both are good to use. For those wanting a family estate with a good dollop of pace to match all the space, VW sold the Golf Estate in rapid GTD diesel form or the sensational four-wheel-drive R with 296bhp from its turbocharged 2.0-litre petrol engine. It’s not just these flagship models that are great to drive, though. 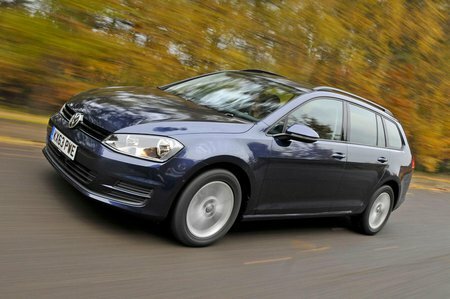 In fact, all Golf Estates offer a relaxed, comfortable ride with precise steering and a great sense of stability for motorway cruising. What’s more, with good visibility and plenty of safety features (some standard, others optional), the Golf Estate is just as happy driving around town as it is trekking up and down the motorway. Although the used market is primarily diesel, for buyers who don’t clock up at least 15,000 miles per year it’s worth spending the time and effort to find a Golf Estate with a turbocharged petrol engine such as VW’s excellent 1.4-litre TSI unit. This will give a great blend of performance and economy, as well as being quieter to drive than either the 1.6-litre or 2.0-litre diesels. VW’s 1.0-litre three-cylinder petrol engine is also impressive in terms of performance and economy, although no cheaper to buy than the 1.4-litre. The Golf was treated to a mid-life makeover in 2016 after which it came with a new 1.5 TSI Evo engine that upped both the power and the efficiency. The VW Golf Estate range starts with S trim and features air-conditioning, a 5.8in touchscreen with DAB radio and 15in steel wheels, although many will have been upgraded to 16in alloys. SE adds those 16in wheels as standard, along with electric rear windows and an autonomous emergency braking system that alerts the driver if they are about to hit the vehicle in front. If the driver fails to react, the car can automatically apply the brakes. GT-spec cars come with sports suspension and 17in wheels that result in a firmer ride, front and rear parking sensors. As ever with a Golf, you’ll pay more for one of these Estates than you would an equivalent model from Ford, Vauxhall et al. However, in this instance, the VW’s cavernous boot and classy interior help justify the extra cost. In short, you get what you pay for.